Growing up, my house was a beet-free zone. Looking back, I’m not surprised since I can’t imagine how my mom would have convinced my dad to eat them. My first encounter with beets took place in Boston. Admittedly, I chose the salad purely for the goat cheese (I’m from the Midwest, people, I love cheese! ), but I was pleasantly surprised by how well the earthy sweetness of the beets complimented the creamy richness of the cheese. I was completely hooked. It still took me another year before I had the confidence to cook them. Beets are extremely versatile and can be incorporated into dishes for every meal, including dessert. Their leaves can be used in many recipes in place of other leafy greens like kale, collard greens, or spinach. The best part is that they are easy to grow, making them ideal vegetables for an amateur gardener to start with. If your thumb is more brown than green, or you don’t have a backyard, summer is just the start of beet season, and they are easy to grow in containers for all you city-dwellers! Choose beets that are small and firm with a deep maroon color. Aim for about 2 inches in diameter. Choose ones that still have the leaves and taproot attached. Avoid beets with limp leaves or wrinkles on the round, as this could be a sign of dehydration. If you see larger beets with “hairs” growing out of the taproot this is an indication of the vegetable’s age and toughness. If you’re roasting beets whole, choosing beets of similar size helps them cook evenly. Remove the leaves, leaving about 1 inch at the top of the round, and refrigerate in a plastic bag. Don’t wash the leaves until you are ready to use them. Beet bulbs can be kept in a plastic bag in the crisper drawer for 2-3 weeks. Use a brush to gently scrub any remaining dirt and remove dangling roots before cooking. Preheat oven to 400°F. Peel and cut beets into 1-inch pieces. Chop carrots into 1-inch pieces. Combine together in a large bowl. Drizzle with 1 Tbsp olive oil and salt and pepper to taste; toss to coat. Pour vegetables onto a large piece of aluminum foil and fold up the edges to form a packet. Place packet on a cookie sheet and bake for 25-30 minutes or until vegetables are fork tender. Meanwhile, cook grains according to package directions. 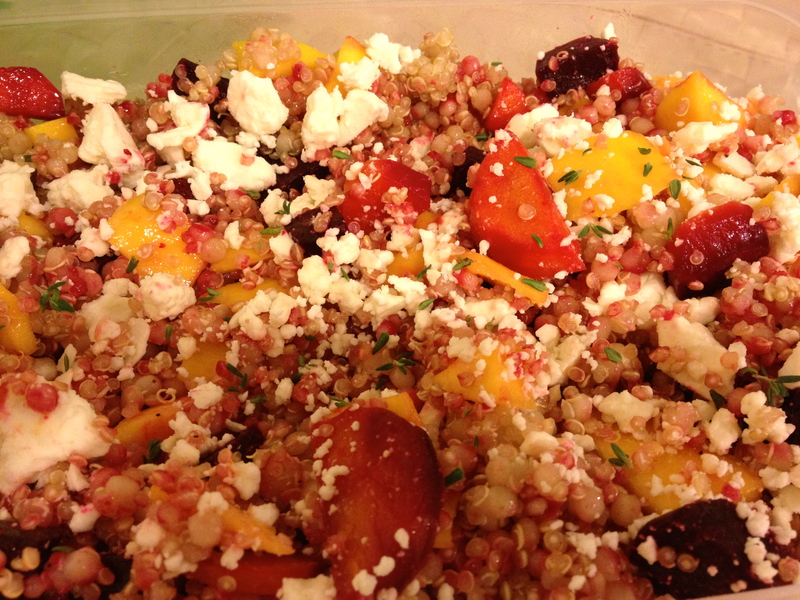 I cooked them both in one pot and just added the couscous in after the quinoa had already cooked a few minutes. Toss the cooked grain with remaining Tbsp olive oil, balsamic vinegar, thyme, and sprinkle with salt and pepper to taste. Top with roasted vegetables, mangoes, and goat cheese. If you mix them all together the grains turn pink. Serve warm or at room temperature. **Number of servings varies depending on whether you use this as a main dish or a side. Makes plenty of leftovers for weekday lunches. 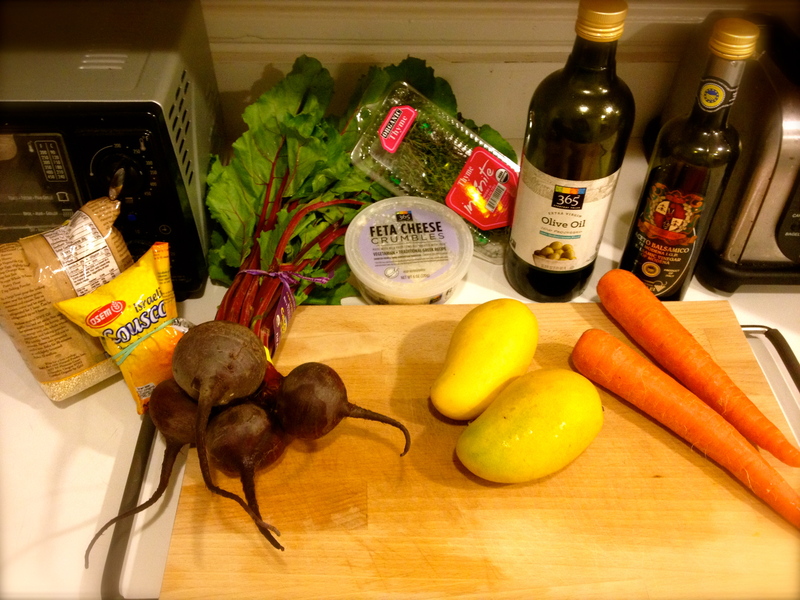 Roughly chop the beets and run them in a food processor or blender with the garlic, almonds, parmesan, and sea salt. With the blender running, gradually add the olive oil. Feel free to adjust the amount of any of the ingredients based on your preferences – I added a little extra cheese after I tasted it. Store in an airtight container in the refrigerator. You can use beetroot pesto the same way you would use traditional pesto. The original chef recommends using it as a pasta sauce (which is what I did), pouring over roasted vegetables, spreading on sandwiches or fresh baguette, or adding to a risotto. Cover the beets with 2 inches of water in a pot. Bring the water to a boil and then reduce to a simmer until very tender when pierced with the tip of a sharp paring knife (or fork). This takes about 20-30 minutes. 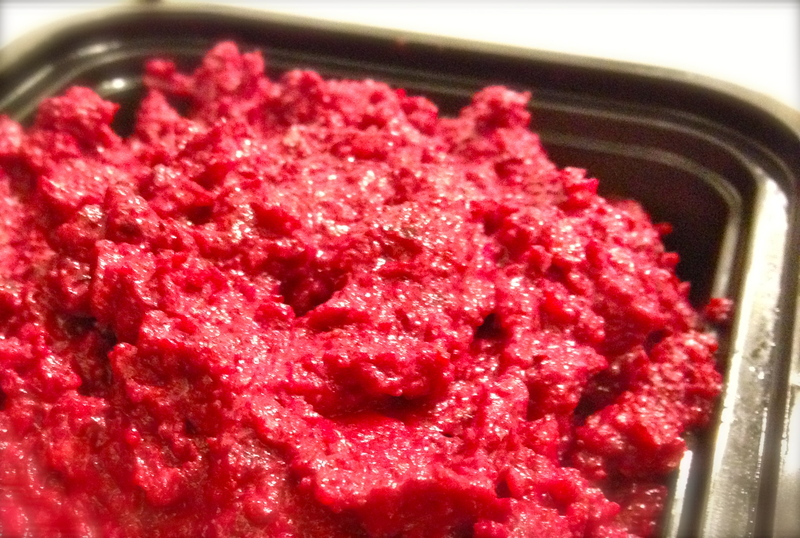 Drain and puree beets in a food processor until smooth. If you don’t have a food processor a blender works, too! Preheat oven to 350°F. In a large bowl, whisk together flour, sugar, cocoa powder, baking soda, and salt. Whisk in eggs, water, oil, vanilla, and 1 1/4 cups beet puree. I added the water first to make mixing a little easier; otherwise you’re muscles get a work out. Coat a 9-inch round cake pan (3 inches deep) with cooking spray. I ended up using a pie pan since that’s all we have and it worked out fine. Pour batter into pan. Bake until a knife inserted into the center comes out clean, about 45 minutes. Let cool in pan on a wire rack for 20 minutes. Turn out cake from pan and let cool completely, right side up. Put the chopped chocolate into a bowl. Put the heavy cream and honey in a small saucepan and bring to a gentle simmer. Pour mixture over the chocolate in a bowl, and let stand for 1 minute. Stir until chocolate melts and mixture is shiny and smooth. I used a rubber spatula to mix it and pressing the chocolate pieces against the side of the bowl helped it melt quicker. Let cool slightly, about 10 minutes. 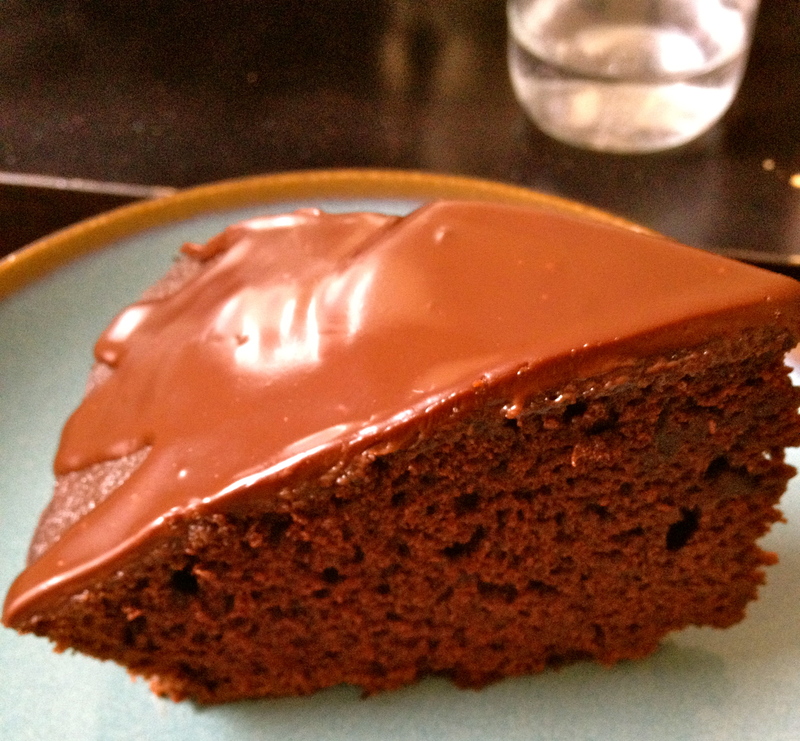 Pour chocolate glaze over the top of cake, it doesn’t have to be uniform (that’s how I made drips down the side. Let the glaze sit for about 30 minutes. Honestly, this was the hardest part. The original recipe uses beet chips as a garnish. From reading the recipe, it seems like they take a long time to make so I skipped this part and the cake was still delicious without them. Martha’s Note: If you’re making the cake ahead of time for a party, the unglazed cake can be stored at room temperature (wrapped in plastic) for up to 2 days and glazed cake can be stored at room temperature for up to 1 day. I stored my cake under a tent of tin foil and it was still okay after 3 days. Beet juice can temporarily dye your fingers magenta. I’ve seen suggestions on the Internet to wear plastic gloves but I found this makes it harder to safely chop or dice the beets. The color comes off relatively easily with dish soap. I also mixed baking soda and dish soap to clean the beet juice out of the knife grooves in my wooden cutting board. Kate Hebel is a second year Nutrition Communication student and registered dietitian. She enjoys exploring new places in the city and experimenting with new recipes to share with her friends.